This is our sweet little Lou. She is a typical 7 year old girl. She's in to Hannah Montana. She likes to shop. She loves lip gloss like (as her aunts say) a fat kid loves cake. So, it is safe to say, appearance is a LITTLE important to her. It was indeed a tragedy when, a couple of days before Valentine's Day, she "kissed the sidewalk" in a pretty dramatic scooter accident. 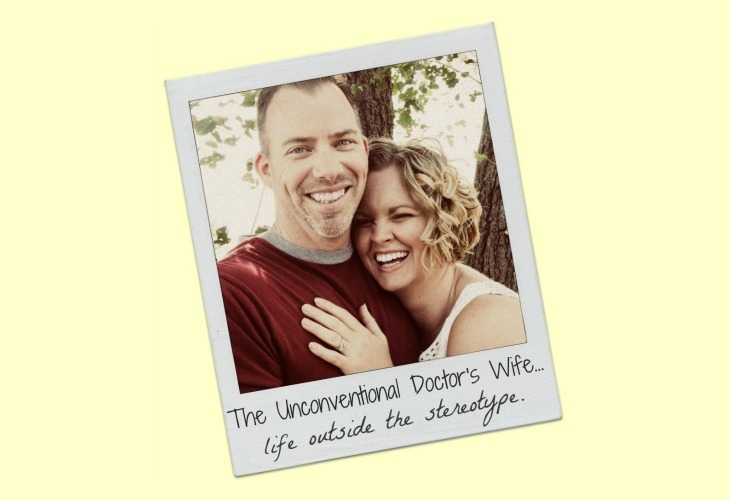 Doc was out of earshot and I was coming home from the grocery store, so neither of us saw it happen, but thankfully our neighbor came to her rescue! I pulled into the driveway and Lou and our neighbor, Kim came walking up the driveway after me. Lou had her hand over her mouth and Kim was carrying her scooter behind her. I noticed she was holding her mouth and I said, "What happened?" She pulled her hand away and I saw that her lip was about 3 times its normal size. Kim's eyes were big and she was motioning to me not to over react at Lou's appearance. Lou hadn't cried or anything and Kim was good at not letting her own reaction reveal the magnitude of the swollen lip. Lou did say, " I think it's pretty swollen, Mom, I can see it out of the bottom of my eye!" And she asked if she could look in the mirror...I told her, "Not yet. 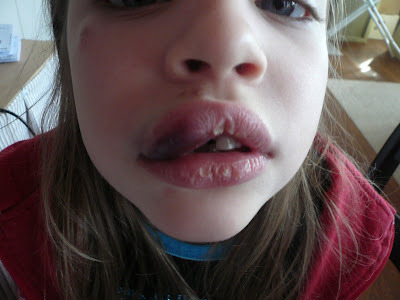 Let's get an ice pack on that lip!" We got an ice pack on it right away and kept it there all night. These photos were taken the next day when the swelling had gone down quite a bit. 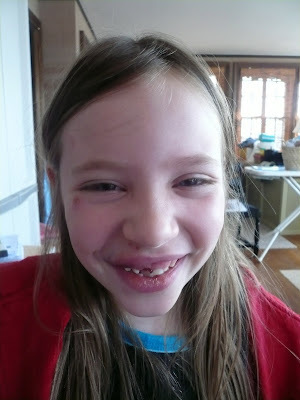 She had also lost her top tooth on that side a few days before. She really looked like she was a scrapper. 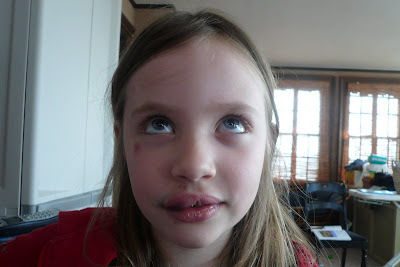 I told her when people ask her what happened, she should just say, "You should see the OTHER guy!" She just giggled at me! 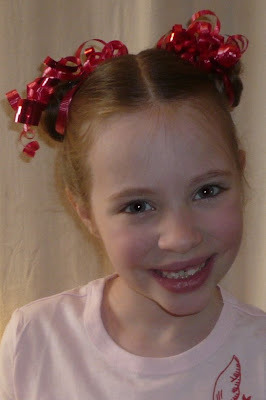 Then, it occured to her that she would have to go to the home school group Valentine's Day party in a few days. She got kind of sad and I could tell that she was upset again. She told me that everyone would see her like that. I told her, "Lou, here is what's going to happen...the first 10 minutes we're there, everyone will ask what happened. Then after that, nobody will even notice and you all will just play." She said, "You're probably right." Fortunately, her lip had deflated greatly by the day of party and (with the help of a little concealer) all was forgotten. Here she is with her best bud, Pixie at the party! 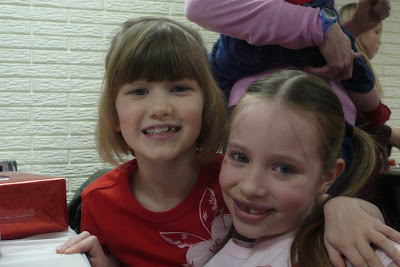 Oh to be 7 again! Good for her. Sounds like a toughie. 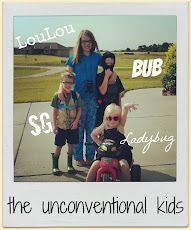 I remember the homeschool days of a seven-yr-old daughter. Now, I'm in my last year with her and I graduate her at the end of May! Oh my! But she has just been awarded a full-ride college scholarship so, God is GOOOOOD!! Is this part of vacationing?!?! Lou Lou is such a gorgeous little girl. With that QUICK healing...God obviously cares even about the little things that are important to her. Glad she could focus on having a great time at the party! OUCH! She and B would have looked great together! :) Poor little thing. I'm so glad it looked better for the big party. Oh poor Lou Lou. She's beautiful even with a fat lip. Matter of fact you can tell her that Cade saw her photo and said "hey Mom, that is cool how did she do that?" Sorry if that sounds a bit sadistic, but he's a boy, also seven years old and at his age they're all about who has the best boo boo.